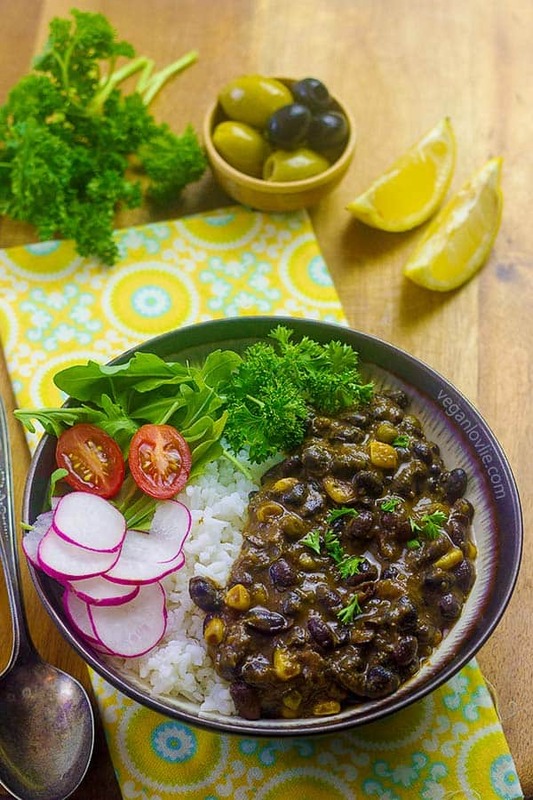 A pressure cooker black bean stew recipe that comes ready in just about 45 minutes from start to finish and makes for an easy weekday meal. This stew tastes like it’s been cooking all day with layers of flavour sealed within the creamiest tender texture of each bean. This post also features a review for the COSORI 6-quart 8-in-1 pressure cooker and a giveaway. This post is sponsored by COSORI. Please read the full disclosure below. One thing that I had to sadly leave behind when we moved to Canada was my pressure cooker. It was a classic stove-top model that used to be my lifesaver especially for cooking beans, legume-based soups and sometimes even a quick one-pot pulao meal. When COSORI proposed to send one of their electric range of pressure cookers for a review, I was as much curious as I was excited to give it a try. I had never used an electric pressure cooker before so I was intrigued to find out about how it would perform. The COSORI pressure cooker is in fact much more; it also functions as a slow cooker, rice cooker, steamer, sauté pot, yogurt maker, food warmer and oven (for baking). Homemade vegan yogurt and baked cake are certainly tickling my fancy – something that I have yet to try in this unit. Out of the box, the COSORI pressure cooker comes with a stainless steel inner pot and a few handy accessories – rice spoon, ladle spoon, measuring cup, one glass lid (for slow cooking, normal cooking and reheating), a steamer rack and an extra sealing ring. Also included are a recipe booklet (not all recipes are vegan) and the instructions manual. There are 15 preset programs that you access via the push button LED digital control panel. The handles are made of hard plastic and remain cool during the entire cooking process. While the tempered glass lid seems to be very durable, the stainless steel inner pot is what impressed me the most. It has some weight to it which suggests it is of good quality and won’t get deformed or dented easily if you ever drop it. I’ve inadvertently put the pot to a burning test! Not that I intended to but, during one of my cooking tests, I did not add enough water in the pot while reheating food and, before I knew it, the food was scorched. I thought the pot was ruined and I was panicked-stricken. However, it all came off smoothly after about 1/2 hour of soaking in soapy water – all the scorched food just glided off with no harsh scrubbing. I was pretty amazed by this and the pot was like new again. Having said that, just make sure you always have enough water in the pot to cook your food. Burnt food is no fun. When time is sparse, especially during the weekday evenings, this pressure comes in pretty useful to say the least. The convenience of various one-pot meals – stews, soups, beans and even dessert – as well as mess-free cooking is more than alluring. At the beginning, I must admit, I was rather nervous with all the settings but once I got used to them, I found this neat pressure cooker to be an indispensable cookware. I wonder how I’ve managed for so long without getting hold of another pressure cooker sooner. Control over the temperature, pressure intensity and cook time are features that I did not have with my stove-top model. So, I’m sold on this model and it has now claimed the spotlight space on my kitchen counter. Aside stews, curries and soups, what I have been enjoying the most in this pressure cooker is beans. Dry unsoaked beans are gracefully transformed to the smoothest tender texture that I’ve ever tasted. Now that I have this nifty secret weapon in my kitchen, cooking beans is a lot more enjoyable – I don’t have to tend to the stove and watch whether the pot is boiling over or running dry or test the beans every now and then until they’re done. With this unit, it’s just a matter of placing the beans, water and spices in the pot, close the lid and press the correct setting. It will cook, beep and keep warm when it’s done. If you want more flavour, use the sauté/browning method (depending on recipes) prior to adding water and sealing the pot. COSORI is giving away a similar unit to one lucky reader or subscriber of the Veganlovlie blog. You get a chance to try this pressure cooker for yourself. This giveaway/contest is open to residents of Canada (excluding Quebec) and US only. To enter is very simple. Just use the Rafflecopter widget below and perform the two mandatory steps. These will get you one entry. You can earn additional entries via the rest of the steps. You can enter until December 5th, 2017 11:59pm EST. A winner will be chosen at random and announced by the end of that week. I will contact the winner by email to get his/her mailing address. If I don’t hear back from the winner within 48 hours, I will proceed to picking another winner. The winner will have to answer a skill-based question to claim the prize. I will then forward your details to COSORI who will get in touch with the winner and send on their prize. Naturally, I wanted to test out one of the most time consuming bean to cook – black beans. I do like to soak the beans though for better digestion. However, the COSORI pressure cooker will cook beans from dry on the highest pressure setting (as instructed in one of the recipes in the recipe booklet). 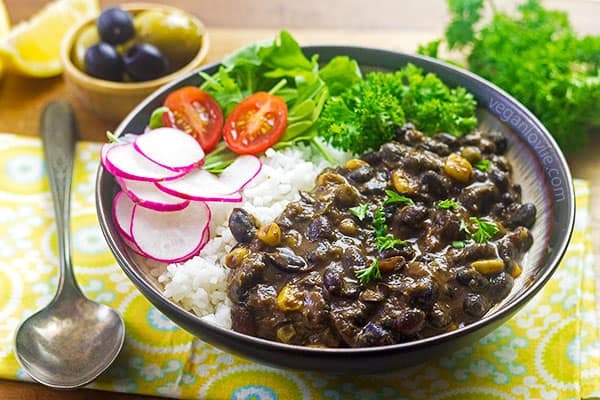 It’s pretty amazing that this black bean stew tastes like it’s been cooking all day but, cooked in a pressure cooker, it comes ready in just under 45 minutes from start to finish, including prepping time (although not soaking time) and resting time. You could toss in some mushrooms, carrots, bell peppers during the browning stage for some extra flavour. Here’s a quick video if you want to see the COSORI pressure cooker in action. *If you want to use dried unsoaked beans, add an additional 1 1/4 cups water. After pressing the beans-chili button, set the temperature and pressure to high-maximum. **If you don’t want the sweetness to be noticeable, just use 1 tablespoon maple syrup. Two tablespoons add hint more sweetness and is a little reminiscent of maple syrup baked beans, although not as sweet. Plug in the COSORI pressure cooker. Press the sauté-brown button. Press start. Let the cooker heat for 2 minutes. Add the coconut oil followed by the minced ginger and onion (if using). Sauté for 1 minute. Add the spices (asafoetida, cumin, paprika, coriander seed powder, allspice, oregano). Sauté for about 30 seconds. Add the crushed tomatoes, bay leaf, maple syrup and soy sauce. Sauté for about 5 minutes (with the glass lid on if needed to avoid splattering). Add the soaked beans, the water and salt. Stir and mix well. Place the pressure cooker lid on and seal. Make sure the pressure release valve is set to the locked position. Press the beans-chili button (It will default to 11 minutes highest pressure and medium temperature). Press start. After 11 minutes, let the steam go down naturally until the float valve (red indicator) is in the down position (it will take about 20 minutes resting time). If you decide to manually let the steam out by unlocking the valve, the beans will be al-dente rather than a creamy texture. Open the lid and let the steam escape away from you. Add the sweet corn and green peas if using. Place the glass lid on. Press the soup button and press start. Let cook until the liquid is thickened to your desired consistency. Leave uncovered for quicker evaporation. Press the stop-cancel button once you are happy with the sauce consistency. Serve with rice or mashed potatoes along with some salad, tomato salsa or coriander chutney. A pressure cooker black bean stew recipe that comes ready in just about 45 minutes from start to finish and makes for an easy weekday meal. Note: If you want to use dried unsoaked beans, add an additional 1 1/4 cups water. After pressing the beans-chili button, set the temperature and pressure to high-maximum. **If you don't want the sweetness to be noticeable, just use 1 tablespoon maple syrup. Two tablespoons add hint more sweetness and is a little reminiscent of maple syrup baked beans, although not as sweet. Like this recipe? Pin it and save it for later. Full disclosure: I received a 6-quart pressure cooker from COSORI for this review and recipe. I was not remunerated in any other way, i.e. no money exchanged hands. All opinions in this review are unbiased and my own; I was not pressured to write a positive review whatsoever. 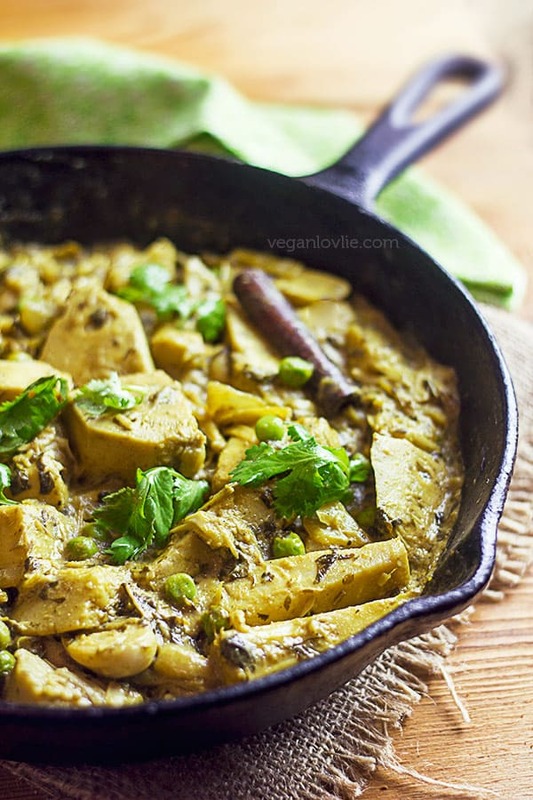 I liked the product after cooking with it for several weeks and hence I am happy to share this review and recipe (as well as host a giveaway for readers/subscribers of this blog). I have not used a pressure cooker myself yet, but have tasted so many dishes made this way by friends, My favorite have been hearty bean stews. Pressure cooking really makes them taste the best. Hello! thanks for the wonderful recipe! and an awesome giveaway. Beans have always been a favorite pressure cooker item for me. My son makes old fashioned oat porridge in his quickpot that soaks overnight, so good! I love soups, stews, curries, grains and beans prepared in a pressure cooker. I’m really looking forward to trying this recipe. It looks amazing! I love soups, stews, curries, grains and beans, even sauces and desserts made in a pressure cooker. I really look forward to making this recipe. It looks amazing! I’ve been looking for a good black bean recipe, so I will definitely try this one. It looks delicious! I’ve not used a pressure cooker myself, but growing up I remember my mom using the pressure cooker often for stews. She also made sticky rice desserts with the pressure cooker that turned out wonderful. I am not really sure! I haven’t use a pressure cooker before! My favorite type of pressure cooker meals are stews for sure! 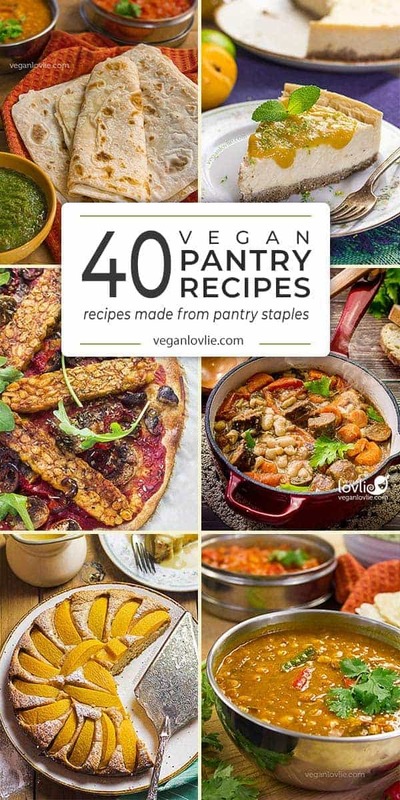 I love any kind of vegan stew ??? This recipe sounds amazing. I don’t have a pressure cooker, so I’ll adapt it for a slow cooker. Thank you for sharing! this looks delicious! i love beans but they trigger my gout (imagine a vegan with gout)… but there are lots of things that can be done with a pressure cooker and i like the feature that i can even take it and cook places where there’s no stove of if we’re ever without one again. I’m Indian, so sorry for being a cliche, but my favorite pressure cooking meal to eat is khichdi. Also daal. But I also make a mean pressure cooker chili, so I’d say that as well. Everything you guys make looks easy and delicious! If I win (I probably wont) I’d be over the moon because I’m moving into my first place soon and I am so looking forward to cooking in my own kitchen! Since every one of your recipes I’ve tried is delicious I know this bean stew will be a winner. I can’t wait to try it out now that it is getting cooler. I eat a lot of bean chilis since they are my favorite in the pressure cooker, they are so quick to make on a busy weeknight. I love using a pressure cooker to make beans. Dried beans are such a better value than canned, and a pressure cooker makes cooking them so fast and easy. This is especially helpful since we eat a lot of beans, so nutritious! I love these pressure cookers that have multiple pre-set functions, like steaming and browning! I don’t have a pressure cooker but I can share the meal I hated the most from the pressure cooker growing up was cow’s tongue. I could always smell it cooking in the pressure cooker as I came home from school. My mom and dad both grew up with it. My grandmother cooked beans in the pressure cooker. I love beans but never mastered cooking them on the stove so I resorted to a slow cooker. Then I learned about lectins and cut way back. I know a pressure cooker eliminates these and cooks the beans way faster! Been dying for a pressure cooker like this! If I win this I’d be soooo happy!!! I have never used a pressure cooker but, I would love to make chili or spaghetti sauce in it! Chili, Jams, Canning veggies from the garden! Lentils, I love lentils so much. 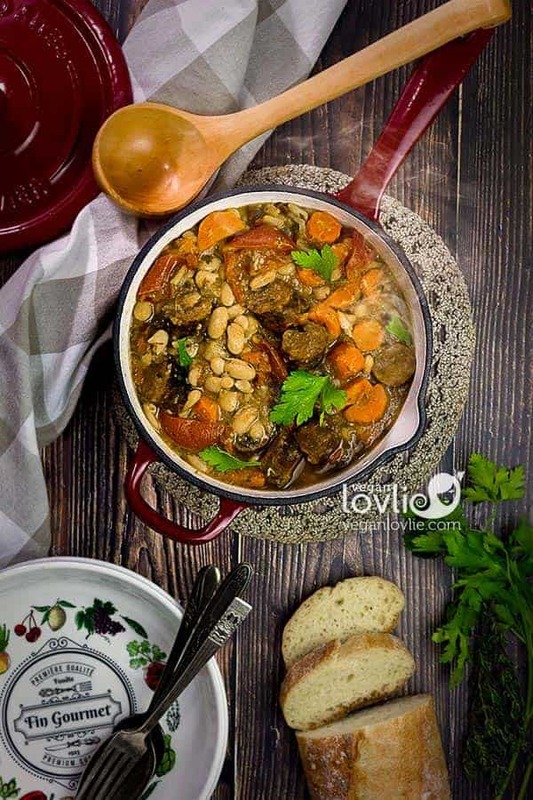 I also love stews, soups and adding a good variety of beans helps me stay full of get a nice variety of nutrients and protein. My favorite recipe for pressure cooking is chili or stew. However, I really like using the pressure cooker for ingredients rather than whole meals like potatoes, beans, rice, oats, etc. The soup looks delicious, and I am fascinated by the was you make it in this pot. I have an old fashioned pressure cooker which I use mostly for cooking beans, but this looks like the ultimate cooking tool. I have never used a pressure cooker so don’t have a favourite but I would love to try it out. would love to get it to cook my beets fast, they take soooo long. I like using a pressure cooker for soups (my favourite is a lentil tortilla soup), my vegan bolognese sauce and coconut curry with quinoa. I mostly cook veggies in my pressure cooker. I look forward to making full meals in it. I haven’t used a pressure cooker before, so I don’t have a preferred meal. 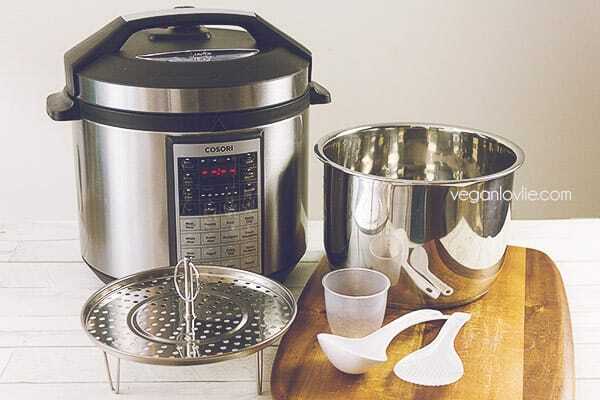 I recently went to a vegan cooking class and they recommended pressure cookers for cooking beans and quinoa, so that’s what I hope to use one for. I love making different soups. I love stews and soups! I love using pressure cookers for soups!